Our spaces can accommodate RV’s 34 feet long. Our spaces have full hook-ups with 30 amp service and 50 amps when used with an adapter. The park has 32 Full Hook-Up RV spaces and due to our location so close to the entrance of the Seacliff California State Beach and ocean, we are nearly 100% occupied throughout the year. Reservations are strongly suggested as many of our visitors return on a regular basis. Of course, we would love to accommodate more visitors, while we are loyalty to return visitors. We hope you can become a frequent visitor to enjoy this beautiful part of California with us, please plan your stay with us accordingly. To reserve your spot, call us at (831) 688-3813 between the hours of 10:00am and 6:00pm, Pacific Standard Time. We are located right along the Pacific Coast between Santa Cruz’ Beach Boardwalk and the Monterey Bay Aquarium. 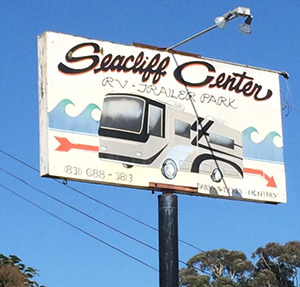 The Seacliff Center RV Park is located in the smaller beach community with a population of 6,220 according to the last census in 2010. The Seacliff Community of Aptos is in the unincorporated region of Santa Cruz County. Aptos is home to both the Forest of Nicene Marks Park and Seacliff State Beach California. Aptos is also the home of the Annual Fourth of July “Worlds Shortest Parade”; the parade route is about .6 miles long. Next door to the park, just a skip and a jump away, is Santa Cruz’ famous MaryAnne’s Ice Cream. You won’t want to miss this treat! Surrounding us in walking distance is Pizza 1, the renowned Manuel’s Restaurant and the Sno-White Drive-In where the fries are hot and tasty.